John Vincent and Amerise Carlton are ready to strangle their mutual friend, Ellen, when she pairs them on a blind date certain to be a recipe for disaster. What should have been a fun-filled evening turns sour when the mismatched couple butts heads over dinner. Toss in an inept waiter, the hottest day of the year, a city-wide blackout, and circumstance goes from bad to worse. Just when rock bottom looms near, the unlikely couple is given a new perspective. A moonlit garden, novelty candy, and a sweet summer night open the doorway to understanding. Can this unlikely couple find the sugary spark of romance in a city engulfed by darkness? Maybe Ellen was on to something after all! LOVE BLOOMS is a new series of sweet interracial romance shorts and novellas. Showcasing what I’ve chosen to tag as ‘Vibrant Interracial Romance’. What do I mean by ‘vibrant interracial’ romance? I want my stories and characters to resonate — to set off an empathetic vibration in my readers because life has taken them into some of the same valleys and has them hoping to reach the same mountain tops. I love my characters, and I don’t want to say their emotions are my playground, but I do believe I can bring out through them –feelings, life experiences, joy and pain that most anyone can relate to. I don’t put them through all their struggles just to create drama– they’re headed somewhere. On their way to discover real connection to another person, a true soul mate. The good and bad they’ve lived through before they get to that glorious place are the seeds planted so that Love may bloom. 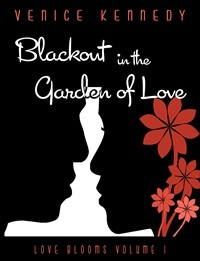 BLACKOUT IN THE GARDEN OF LOVE is Vol#1 of the LOVE BLOOM SERIES. I really enjoyed Blackout. When will the next story be published, and how many books are in the series? Thank you, and keep writing. Thanks so much, Marcia– for stopping by and for your support and encouragement. I absolutely appreciate it. In regards to the Love Bloom Series, I have another story “Tending Deacon’s Garden” in the hopper. It’s a much longer, deeper character-driven story rooted in two wounded people and their crooked road to finding each other. Hoping to get that out sometime this year or early 2014. I had hoped to publish the second story in 2013, but some urgent family matters garnished most of my attention. I will be though, publishing a full novel this year. It’s titled ” I See You” and please check back to my blog, as I soon will be sharing lots of info about my bringing that to press and I also will be sharing some excerpts from it. I was just getting my feet wet with Blackout, which I’m so happy to hear you enjoyed. These next works from me will be much bigger and ‘vibrant’ stories showcasing some characters I have come to love. Again, thank you. Your words came at a perfect time.